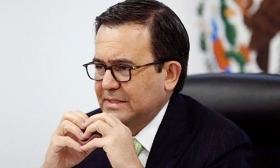 MEXICO CITY - Mexico and Canada would remain in the North American Free Trade Agreement even if the Trump administration abandoned the accord, Mexican Economy Minister Ildefonso Guajardo says. Guajardo was speaking a day before U.S., Mexican and Canadian negotiators meet in Mexico City to work on updating the 23-year-old trade accord, which U.S. President Donald Trump has threatened to dump if he cannot rework it to his satisfaction. The negotiations in Mexico City will be the second round on revamping NAFTA after talks in Washington two weeks ago. Trump argues the accord has cost the United States jobs and industrial capacity, while Mexico says the integration of the region has made it more competitive, helping to protect jobs. “Neither Canada nor Mexico will announce their departure (from NAFTA) because we want to keep being regulated by NAFTA,” Guajardo added after a meeting with lawmakers. Data compiled by the Automotive Manufacturers' Association shows 64 Canadian companies have 120 facilities that employ 43,500 people in Mexico. Most of the parts they manufacture are used in vehicles assembled in Mexico or the Southern United States. In November 2016, Gov. Francisco Domínguez Servién from the state of Querétaro, Mexico, met Ontario Premier Kathleen Wynne and APMA President Flavio Volpe to discuss strengthening trade ties between the countries. Ontario-based parts makers Magna, Martinrea and Windsor Mold all have facilities in Querétaro.